I love blue and white and besides dishes, blue and white objects fill Linderhof. I'm extremely partial to blue and white bowls -- there is one on top of the Chinese cabinet in the living room -- the Chinese cabinet in the dining room sports three! And tabletops are perfect for a blue and white bowl!!! 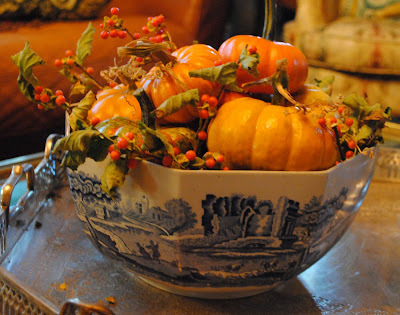 And those tabletop bowls are perfect for seasonal decorating! What fun it is to decorate them each season! On the coffee table in the living room is a Spode bowl in an octagon shape and sometimes it's filled and sometimes not -- depending on the season. If it's empty and push comes to shove and I'm having company, one of the orchids fit perfectly into the bowl and give color for the evening. The potpouri of summer gives way to an assortment of mini pumpkins and bittersweet for fall. It will stay this way through Thanksgiving until we're ready to decorate for Christmas. On the dining room table is a huge blue and white bowl -- a coveted item that was way more than my purse but one sale at Tuesday Morning, they had an assortment of big blue and white bowls -- we were in Las Vegas for a meeting when the sale occurred and dear Husband Jim drove me to a Tuesday Morning just so I could get that bowl that I had dreamed of. And then I had it shipped back home!!!! I knew it would be perfect for the dining room table as a centerpiece and I actually love the empty bowl as a centerpiece -- it's really too big to hold flowers for a dinner party and so often, it is relegated to the space under the sideboard when we have company. But in fall filled with pumpkins and bittersweet it does make the perfect centerpiece! 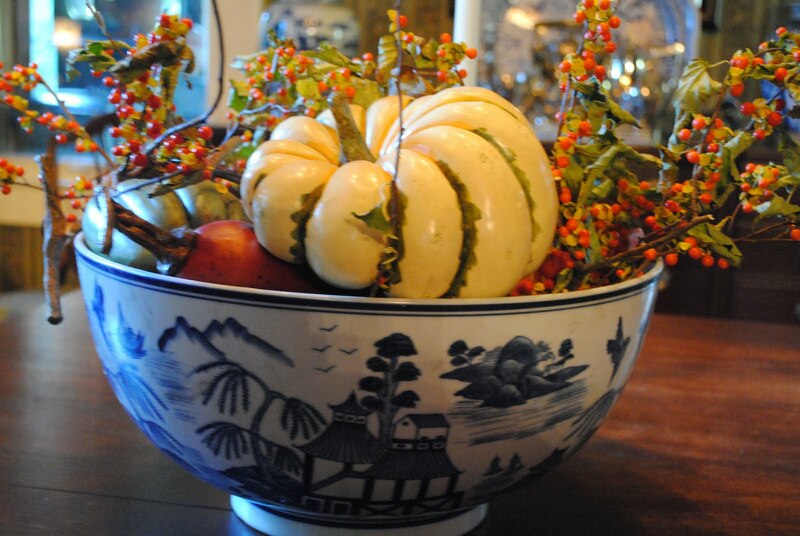 And I love the oranges and greens and whites of the pumpkins and gourds with the blue and white. 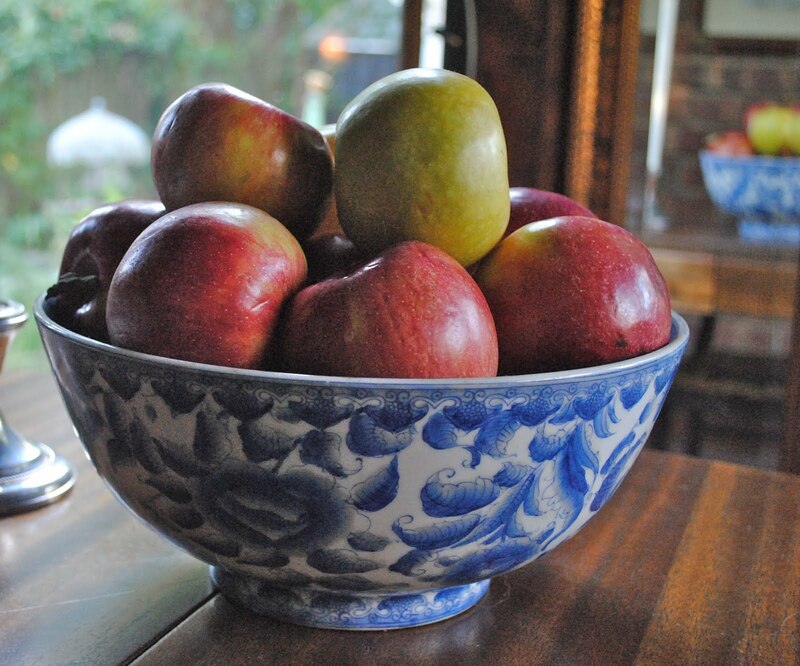 The breakfast room table changes often - the blue and white bowl gives way to a vase or a pitcher full of garden flowers -- and sometimes, we have both -- if the blue and white bowl is filled with fruit then the smaller blue and white pitcher with garden flowers completes the vignette. And for fall -- Farmer's Market apples which we'll replenish week after week -- I love the smell of apples that permeate the room. And I like the mix of green and the rusty red of local apples (rather than the too perfect colors of supermarket apples). They're not for decoration -- they are for eating and we'll often munch on one near bedtime. I've been slow this year with fall -- knee surgery does that but then when I realized that Friday was October . . . . alas, I needed pumpkins!!!!! Our local Farmer's market is a great source for both pumpkins and bittersweet (and a really nice bittersweet wreath came home with me as well). It's Monday which means that it is Blue Monday -- so visit Smiling Sally to see what other blues there are this Monday! I know that there will be a bright blue sky over the prairie on Monday! Oh my goodness! I love all 3 of these bowls. Okay, maybe the Spode is my favorite. I love a bowl full of fall. I love your bowls and I love how you've filled them. So Autumn! My big blue bowl is empty, but not for long. I was at the market early today and brought home gourds and squash - now just have to cut some branches with berries and I'll make an arrangement in the bowl. Your's are all so beautiful! The bowls are ALL so beautiful. I love the pumpkins and bittersweet displays, so lovely and seasonal. I've tried to get small pumpkins locally (UK) but we only see large ones around Halloween that are usually used for Jack 'o lanterns...oh well, I'll keep trying! Love them all Martha! And I hope you're up, around, and feeling yourself again! The bowls are delightful! They go so well w/ fall..Well done..
Ah, now THAT'S perfect fall decorating! Those are beautiful bowls and you are using them in such a nice way. Lovely post for today. those apples would be gone in a flash around here. Love the Bowls. I have always like the spode patterns. What beautiful bowls and you have decorated them with the contents so well.